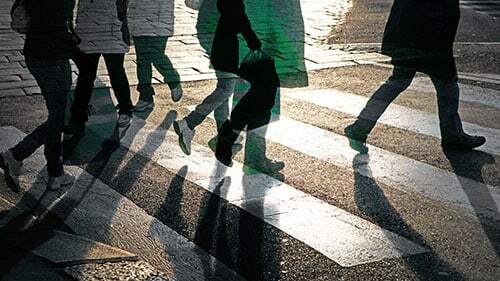 The Aurora pedestrian accident attorneys of Rosenfeld Injury Lawyers LLC represent the interests of injured pedestrians or the families of those who have been killed in auto accidents. The nature of these accidents can make them catastrophic; rendering victims disabled and forced to live at a reduced quality of life. When such events are the result of distracted driving or irresponsible behavior, we will do whatever is in our power to make sure that the driver is held fully liable within the limits that the law will allow so that you can receive the compensation you need to pay for your medical expenses, lost wages and other expenses. Before you can expect to recover compensation for your injuries, you need to be able to provide enough proof of the driver’s negligence to convince a jury in the event your case goes to trial. We know that it is not always possible to recover this evidence when you have been injured and need emergency treatment right away, so we try to establish the facts through a number of methods that will build a strong case on your behalf without burdening you to gather all of the evidence yourself. The ways we can establish fault include the following. Getting copies of the accident reports from the police so that we can review witness statements, evidence that was gathered by the responding officers and more. It is here that we will also collect information about the witnesses so that we can contact them for another statement. In some cases, they may remember things during an interview they didn’t before. Sending a team of reconstruction experts to review the scene of the accident. It is there that they will use evidence such as damage to the vehicle, skid marks and other information to reconstruct the events as they occurred. They may determine that the driver made little effort to avoid the accident because he or she was distracted or that he or she failed in an attempt to swerve or hit the brakes. Obtaining video records of the event. There are cameras everywhere in society now, and while this does pose certain issues over privacy, it is worth noting that the cameras at stores, intersections and other businesses can pick up an accident; providing undeniable evidence about how things transpired. Requesting recordings of the 911 calls made following the accident. This can be used to verify witness accounts or to refute conflicting statements. Collecting phone records of those involved. This can reveal that the driver was texting or talking on the phone while driving. Not only is this illegal, but it is the cause of many distracted driving accidents. Insurance companies may the majority of the compensation awarded for auto accident claims and we have the ability to negotiate with them in order to make sure you are treated fairly. It is important to know what avenues are available so that you understand that policy limits and a difficult insurance adjuster are not enough to prevent you from getting the compensation you deserve. Here are the ways we can collect all of the money you need to pay for your expenses. Working with the driver’s insurance company to negotiate a settlement— when this does not work, we may be forced to take the claim to court. However, the insurance company may only be required to pay damages in the amount of the policy limit, which may not suffice if your expenses are greater than those limits. Filing a claim with your health insurance— we know that working with any insurance company can be difficult, which is why we can handle negotiating a claim with your health insurance company to cover the gap between what the driver’s insurance company will cover and what you are owed. Using your own driver’s insurance— you may be able to activate your uninsured or underinsured motorist clause in order to recover additional compensation if this is required. Suing against the driver’s assets— if you are unable to secure fair damages through the other means we’ve mentioned, we may conduct an investigation to determine whether the driver has assets that can be used to pay the claim. If this is the case, we can leverage those assets to ensure you recover every bit of compensation to which you are entitled. Rosenfeld Injury Lawyers LLC is a leading advocate for the injured throughout all of Illinois and we have helped thousands of injured pedestrians secure the compensation needed to move forward with their lives. If you have been in an accident, we would like to invite you to review your legal options for free during a free case evaluation. Contact us today to be connected with an award winning Aurora pedestrian accident attorney so that we can let you know more about how we can help you. We work on a contingency basis, which means our services will cost you nothing if we are unable to get results on your behalf.